Thanks, Jenny - but of course I had already googled the words. It's not an easy poem for me to fully understand. I get the gist, mind. Frankly, 'yorz, as a native English speaker and with a Masters in literature, I don't fully understand it! Thanks for reviving this thread, Strawberry. I've enjoyed browsing through it and being reminded of some stuff we shared a while ago. What were they like, the people of Vietnam? 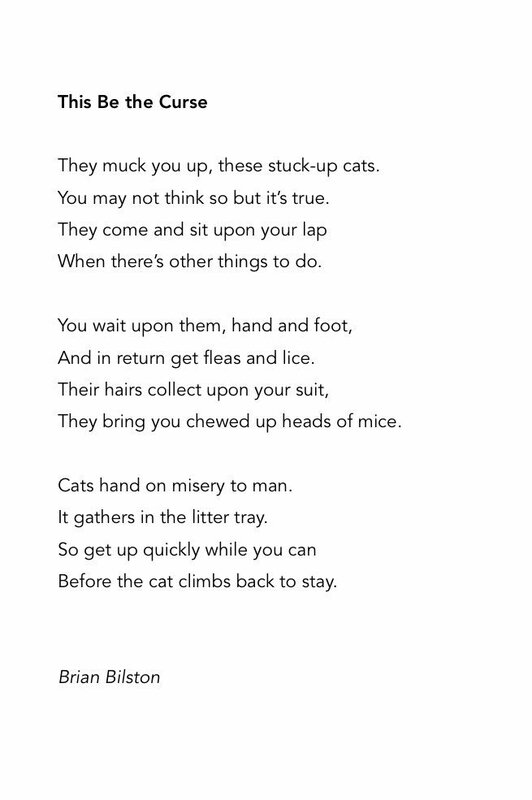 A nod to Philip Larkin in honour of National Pet Day. I'm a little teapot, short and silly. Here's my handle, here's my willy. When the tea is ready, here me hiss. Lift me up and see me piss. Former children's laureate (!) Michael Rosen on Twitter about 20 minutes ago. That should be "hear", I imagine. Ahem. Pardon the spam but my book of poems Sending Bette Davis To The Plumber is now available from Moon Pie Press. I just wondered how a writer/poet can let that one slip through. Though I may have to report it to the moderators. That's great news, Jenny. You must be chuffed.